Found this and had to share. Can anyone relate to any of these? Throwing myself out there is difficult. I’m an introvert who is uncomfortable in social situations. I don’t always show it, but when I get home after being around people, I need several hours to myself to destress and unwind. As an author, you have to interact with people and make connections. This has always been a challenge for me. Releasing my books to the general population is nerve wracking and scary. I’ve always been an overachiever and am super critical of myself. I’ll never be satisfied with my work. I ALWAYS find something wrong with it no matter how many times I read over it. My characters speak to me, and I tell their stories. But these stories won’t please every reader. In fact, I can almost guarantee there are haters out there. Some people just don’t get the way my brain works. Others will totally relate to my work and enjoy the stories I write. I don’t write to please the masses. To me that’s not what writing is all about. I write for myself, to tell my character’s story. Hopefully, I’ll gain a few readers along the way, readers who understand the way I think and relate to these characters in my head. A LOT goes into writing a book. Much more than the reader ever sees. The idea for this post came to me after I did some research on the ‘overnight literary success myth.’ I have always been intrigued by the term and the notion that success JUST happens to authors. Surely there is more to overnight literary fame than meets the eye? Once you type this myth into Google you can expect to see an array of interesting articles and blog posts on the subject. Great insights here. Definitely worth reading. As y’all know I do a ton of reading and this includes lots and lots of blogs and articles. Over the holiday I ran across one article that just had me jumping up and down and yelling, “YES! THIS!” The Business Insider article “13 Things Mentally Strong People Don’t Do” is based off Amy Morin’s book (which I highly recommend). It doesn’t matter if we strive to have a healthy marriage, strong kids or a killer career, these tenets cross-apply to all areas of life. Mental toughness is a key component to being successful. Yes, even for writers. So I figured I would tinker with this and make it more directly apply to writers and what we must do (or not do) if we long to do well in this career. 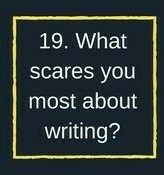 Thus, today we are going to discuss 13 Things Mentally Strong Writers Don’t Do.